Preheat oven to 325F. Spray cookie sheet with cooking spray. In large bowl, cream butter. Gradually beat in confectioner's sugar until light and fluffy. Blend in flour and cornstarch until blended well. Mix in almond and vanilla extracts. Form dough into 1 inch balls. Place 1 inch apart on sheets. Bake at 325F for 15 minutes or until cookie is firm to the touch, they should not brown. 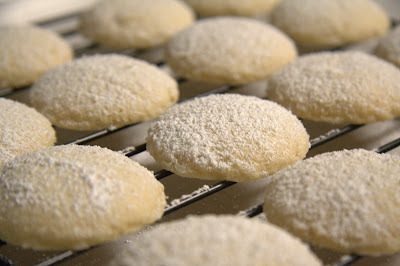 Remove to wire racks to cool.While still warm, dust cookies with confectioner's sugar. Makes 3 dozen. These little cookies sound HEAVENLY!!! I have become a follower of your blog. I love to share new recipes and ideas, come by and visit maybe you can do the same. Wow, they sound good and look adorable. 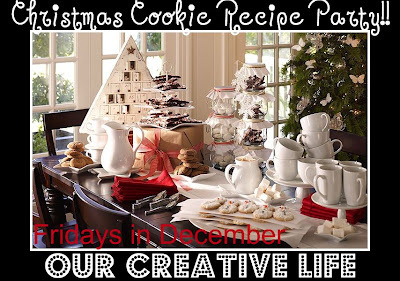 They would be great to add to cookie bags for friends and family. The dusting of sugar is so pretty. These sound great! I love the way they look, too! I like anything with almond extract. I'm getting hungry looking at all these cookies. Putting these on my list to try.